Every travel package we put together is a custom Costa Rica Fishing adventure. You tell us what you want, your time frame and budget and we’ll match you up with the best vacation rentals and charter boats in the Jaco Beach and Los Suenos Resort area. The Los Suenos Resort and Marina is the premier sport fishing destination in Central America. 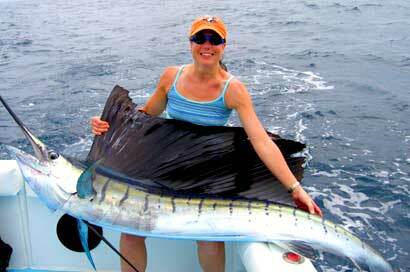 Nestled in horseshoe-shaped Herradura Bay the Los Suenos Resort is perfectly situated to provide quick access to spectacular deep sea and inshore fishing for Sailfish, Marlin, Tuna, Dorado, Wahoo, Snapper, Roosterfish, Snook and more. Besides great fishing there is a beautiful world class golf course with incredible jungle and ocean views. There is also tennis, fitness facilities, day spas, canopy tours, quad runner tours, day trips, horseback riding, world class surfing, national park tours, nightlife, casinos, shopping and much more. These are just examples of the types of vacation packages we have put together for our customers. Tell us what you want to do and we’ll design a custom travel package for you.